Days grow shorter. Temperatures dip lower. There can be a temptation to follow the bear’s example and hibernate during these cold winter months, but we know that it is important to stay physically active all year long. 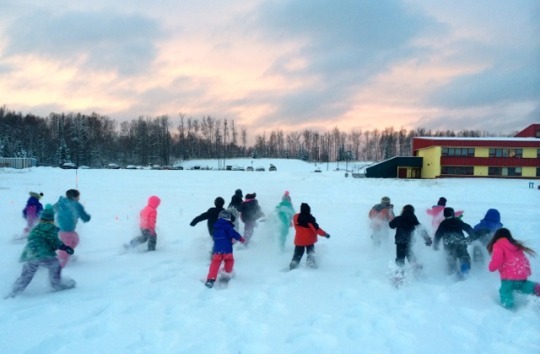 As a physical educator in Alaska, teaching my students to enjoy being active outdoors during our short winter days is one of my favorite challenges. From October through March, we keep our fingers crossed for a season of plentiful snow to create a bright winter playground for exercise, adventure, and exploration. Snowshoes offer a wonderful way to experience nature in wintertime. The wide variety of today’s snowshoes are simple to use, making snowshoeing easy to master and revealing a winter world that may otherwise go unexplored. After a bit of practice tramping along packed pathways and breaking trail through deep snow, my students become comfortable on snowshoes, allowing us to head off together on the trails around our school. Searching for animal tracks, identifying different types of trees, breathing in the cool wintry air, listening to the songs of winter birds – these are the unique experiences of snowshoeing that make it such a great choice as a winter physical activity! Throughout the fall, students have been training their core muscles and improving their balance. 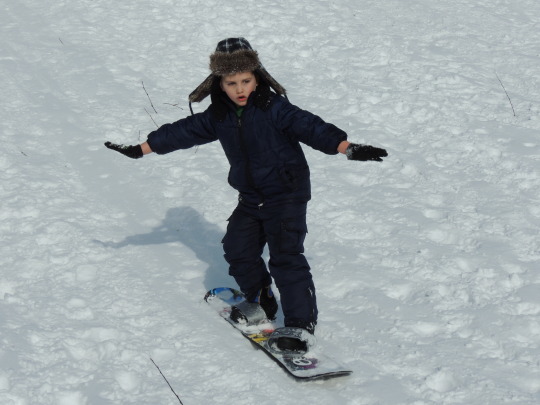 This means that once we get a solid snowpack on the ground, our students are ready to practice their snowboarding skills on our small “bunny hill.” Encourage the little ones to share a board with a partner so they help each other to step securely into the straps. With a reminder to bend their knees and spread their arms for balance, they “whoosh!” down the gentle slope. As they take turns and share helpful feedback about their partner’s body position, it’s as if each student has his/her own teacher. The joy on the students’ faces as they find their balance and make it down the slope successfully is unmistakable! Regular physical activity is important for the health of our bodies (lowers blood pressure, reduces risk of heart attack and stroke, lowers risk of diabetes, etc.) as well as for the health of our brains. In children, research has consistently demonstrated a connection between physical activity level and academic performance. Physical activity increases blood flow and oxygen to the brain, and stimulates cell-growth in the hippocampus, which controls learning and memory. These benefits are good for us all, at every age. Parents are also looking for ideas to get outside this time of year. Students sharing their excitement about physical education adventures can provide ideas for the whole family! I’m not surprised to learn that snowshoes and snowboards often end up as holiday presents. Winter is a large part of life in many areas of our great country, and finding fun and active ways to get outside and enjoy it is crucial. Whether it is snowshoeing, sledding, skiing (cross-country or downhill), snowboarding, fat-tire cycling, ice-skating, ice hockey, skijoring, or another pursuit, enjoying active winter fun makes life better. Share this post by using the sample tweet: @SHAPE_America member + 2014 AK elem. #physed teacher of the year, @RushNance, shows us how to embrace the cold + stay active outdoors!